Edwise, overseas education consultants, are organizing the 26th World Education Fair in the city. Edwise represents over 575 Universities & Colleges worldwide. 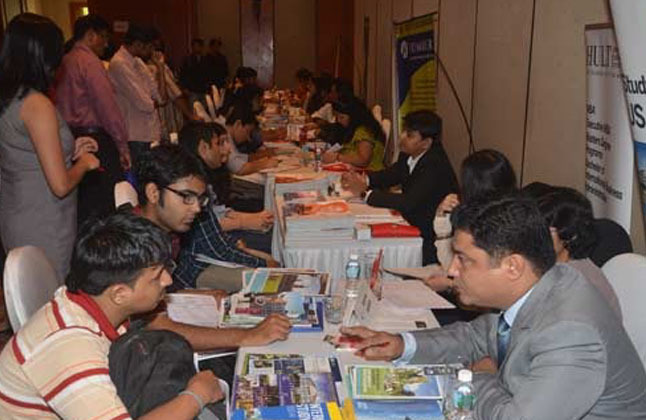 Over 80 international university representatives from the UK, US, Canada, Australia, New Zealand, Singapore, Germany, Ireland, Switzerland, Spain, Italy and Dubai are expected to be present at the fair. The U.S. Consulate will give a Presentation on Studying in the United States and Student Visas at select cities. The event offers attendees opportunities to interact with delegates from various academic institutions on a one-on-one basis. It will give students an opportunity to gain access to admissions information of various universities and to make an informed decision while selecting their higher education institute abroad. Students will receive assistance to apply to institutions that are not present at the venue too. Over 300 students received part/ full scholarships through Edwise. Scholarships ranging from 5% - 50% of the total tuition fees amounting to over Rs. 5 crore have been awarded to deserving Edwise students. All queries on visas, loans, financial assistance and a comparative analysis of educational global systems will be addressed by experts. Scholarships will be given to meritorious applicants and application fee waivers of up to Rs 35,000 will be provided to eligible students. In the past, attendees have secured scholarships ranging from 5-50% of the total tuition fees, amounting to over Rs 5 crore. Apply to renowned universities from around the globe. Guidance on the universities admission process. Learn about scholarships and application fee waiver opportunities. Process your application for the upcoming intakes. Obtain on the spot offers from universities. Obtain guidance on visa process and availability of educational loans. Get guidance on IELTS/TOEFL/PTE/GMAT/GRE/SAT Coaching. FREE assistance from admission to visa to all students who apply in the fair. Massachusetts Pharmacy and Health Science. Venue - Le Meridien, Sassoon Road, Pune. Meet 80+ Universities from 12 Countries*, in 15 Cities* at the India's Largest International Education Fair from 10th September 2016 to 1st October 2016 at select cities across India. Pre Registration with Edwise is mandatory to meet with university delegates. Bring Original documents & 5 sets of Photocopies for Spot offers. Entry is free. Parents and friends are welcome. It is an EVENT that you CANNOT afford to MISS! For free registration to the World Education Fair, visit www.worldeducationfair.com or contact Edwise on 1-800-200-3678 (Toll Free) / 08600911333.